Many of us are scared of feelings and we do whatever it takes to repress them. Even our brain is wired like that. Feelings are not scary, suffering is. Unfortunately, we mistake the two with each other. Your feeling is your healing. Feel the feelings instead of repressing them or acting them out in hurtful and unconscious ways. Discover the last of the three keys that will allow you to overcome love addiction. We will be diving into the third key for how we can overcome love addiction. What I will lay out for you is the essence of everything that I have to offer and your ticket to healing. You find the keys number one and two in the past two episodes. The combination of these three keys is crucial in overcoming love addiction. Key number two was to leverage the incredible value of triggers resulting from an intimate relationship, but also from life in general. Triggers are worth million dollars of therapy because they put you in the perfect or ideal feeling zone. Let’s talk about key number three for how to overcome love addiction. It is by feeling the feelings behind a trigger. Feeling the feelings instead of repressing them or acting them out in hurtful and unconscious ways. Why am I saying that feeling is key? The moment we get triggered, our nervous system goes into survival mode because the trigger signals a threat and not being loved is definitely a huge threat for our system. When we were little, not being loved, might as well have meant that we might actually die, and this fight-flight survival mode is what makes us often behave involuntarily without having much control over our behavior. When in that state, things happen and this is when our mind switches off. We make the wrong decisions and we lose control over how to deal with the situation. The reason for that is that thoughts, logic, thinking and reason come from an area of the brain called the neocortex. Survival in fight or flight mode, however, are triggered in the brainstem. The brainstem has no intellect. It is physiological and instinctive. We can’t think clearly when the brainstem takes over. When the brainstem takes over, we do things that we would never do if we had a clear mind. Being under attack, however, does not allow us to think clearly. If our system is under attack from the potential threat of losing love, it will do anything to ensure survival. This is why when we are being triggered, we often can’t stay rational and do the right thing, so we lash out. When being triggered in our fear of abandonment or rejection, many of us simply cannot stop calling, texting, or contacting that person. Even if the person is doing harmful things to us, such as not responding, betraying, lying, playing, abusing, ignoring, and so on. We still accept him or her and even still want them. Even though we know that he or she is no good for us. We keep hanging on to something that does not serve us because the way we are wired makes us do that. If we want to step out of unhealthy, harmful situations, we have to ensure that our system is no longer under alert and in survival mode. That means our agitated nervous system, as a result of a trigger, needs to calm down so we can think clearly. The only way to calm our nervous system when being triggered is to actively work with that trigger, which means to feel the feelings behind the trigger. First, we have to be aware that we are triggered. Then we have to become vulnerable and share how this makes us feel. If we can’t do that, we have to immediately remove our self from the situation. In any case, we have to take the time to dive into the feelings that are being triggered. This is the reason why feeling is key to overcoming love addiction. Let’s talk about what this means and where the challenges are in doing so. The best and most efficient way to feel our feelings is to make use of the ideal feeling zone because, in the feeling zone, the magic happens. The ideal feeling zone is the place where we have access to our feelings. Having access to feelings, meaning being able to feel properly, is probably the hardest thing for us. To have access to these feelings in its purity is not an easy thing. We’re not used to feeling, we’re used to repressing feelings. This is how we coped when overwhelmed when we were little and it is our brain’s function to protect us from too much emotional upheaval. It is like a survival mechanism and it had its legitimacy because as a little child, it was overwhelming. It’s how we coped with something that seemed impossible to deal with, such as the potential threat of not being loved and not receiving love. We also never learned through either witnessing our role models or through having been taught how to feel proactively. Most of our parents were and are still scared to death to feel, as they themselves have never had proper role models when it came to feeling their feelings. Most of us have never even been encouraged or allowed to feel what was going on. We had nowhere to go with our feelings. For that reason, we also don’t know what to do with our feelings. Did your parents continuously ask you, “How do you feel? Is there anything you want to share with me? Honey, you look sad. What’s going on? Tell me all about it!” I don’t think so. As children, we had so many feelings all the time because we didn’t have a whole system of defenses yet. We were fully open when we came to this world. For a long time, when we were little, and we couldn’t even speak yet or make sense of things, it was the only way to express ourselves. Repressing feelings will never make them go away. As a matter of fact, they grow. Psychologists call that amplification where they want to be noticed at some point. If we keep repressing them long enough, we will have to find ways to keep them down as they will continue to surface at some point or another. The moment we have access to what we’re feeling, we’re able to stay with it and dive into it. This is what will relax our nervous system and ignite transformation. The triggers will bring us there very quickly because it makes it acute. In the moments when we don’t have access to our feelings or we’re not in the ideal feelings zone, meaning we know that there is something, but we can’t feel it, it means that we’re either disconnected or overloaded. 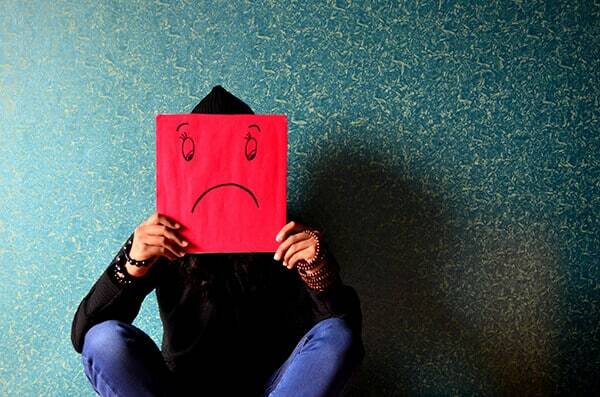 We are disconnected when the feelings are either too much to be felt at a given moment and we, therefore, have to repress it, which is a state of defense and denial and then it’s hard to have access to feelings. Or we are overloaded and missed to feel for already quite a while. Mostly meaning that there were many triggers and feelings that wanted and needed to be felt, but we missed the chance to give space to them and then, we’re in overload. Neither of these two states will allow us to dive deeply and purely into feeling and stay with it so we can ignite connection and transformation. You will have to work so much harder to get to them fully. Heal What You Can Feel: We make one big mistake and that is to confuse feeling with suffering. We have to stop being afraid of feelings, they make us human. Feelings are the compass of our hearts. They tell us everything we need to know to do the right thing. Suffering is a result of two things. On one hand, we suffer when we do not have access to a feeling because we’re either in overload or simply too disconnected. For example, we only feel that there is a heavy knot in our heart, but we cannot feel the pain behind that knot. That pain behind that knot would have us sob and that knot just stays and stays. It can drive us mad and depressed. That is suffering, for one. On the other hand, we suffer when we have to repress a feeling because we’re too ashamed of them or we’re asked to repress them. Many boys were told, “To man up or boys don’t cry!” But also for women, in my corporate career, I had moments when men would tell me to leave my emotions outside the meeting room and that just killed me. I kept swallowing but run into two burnouts already by the age of 28. Having to keep up my professional mask at all times definitely contributed to me burning out. Let’s say you are in a relationship and your partner doesn’t hold space for your feelings in day-to-day life. You have to always keep it down because the guy is uncomfortable with feelings himself or does not want to deal with a woman who doesn’t “function.” This will eat you up inside sooner or later and manifest in ways that are unhealthy and that is suffering too. Those people who ask of us to keep the feelings down are often uncomfortable with their own vulnerability. Sharing your feelings make you vulnerable and you let them see the most naked state of your heart and soul. That for many is a scary thing. What if you decide to be vulnerable by choice because it’s what you stand for and you value being you more than being afraid of looking weak? I call that empowered vulnerability because ultimately, you know that being vulnerable is being true to yourself. It is the highest form of integrity we can have towards ourselves. Feeling in its purity is nothing but relieving. It has a quality that truly calms our nervous system and that is what we get when feeling instead of repressing. Our nervous system calms down. When our nervous system calms down, we can see more clearly, we can take the right decisions, make better choices and take the next steps with awareness. If our nervous system is agitated, which is often the result of a trigger, we don’t see clearly. We act out because our system does whatever it has to do to get out of the potential threat state back into balance. It is often involuntary. There are some feelings that are more difficult to feel, such as utter fear or terror. Most of the feelings I had to feel in order to transform love addiction were very possible to feel despite the very many tears I had cried. Once I had access to my feelings, it felt so good even though I was in agony and crying over something that ripped my heart apart. We’re all different and for some people feeling certain feelings might be overwhelming. I always recommend seeing a licensed therapist in this case. If we want to transform something as challenging as love addiction, we have to have the courage to do what we did not want to do or simply were unable to do so far. We have to allow our pain to be felt in its entirety. Key to transforming love addiction is to feel what gets triggered in us. Learning to feel, to have access to our feelings is the variable for our success. Learning how to feel instead of acting out involuntarily however takes time and practice. It’s a skill like any other, but once we know how to acknowledge and feel our feelings, it changes everything. What does feeling instead of acting out look like in real life? I want to make an example. Let’s take a typical love addict like me, I used to be a typical love addict. The typical love addict mostly engages with the avoidant love addict. Their dynamics are such that the typical love addict runs after the avoidant one. The avoidant one has control over the typical love addict who is hanging on a thread constantly hoping that he or she will be fed with some more love, even if that comes in dribbles. I remember it clearly, I’d look at my phone in distress. I tried to analyze his texts and how he meant his words. I obsessed over him from afar. He was all I could focus on. I got into such obsessive states where I would even end up at his house or try to figure out where he was or try to control when we’re going to see each other again. I would also allow him to abuse me emotionally sometimes. I’d lose myself in him and our relationship completely. The obsession, the stalking, was me trying to get out of what I would have needed to feel if I did not do that. If I was not able to contact him, if indeed he would have vanished. There were horrible feelings coming up for me when in this state. The focus can shift once we are feeling and if it does, just let that happen. Don’t filter or analyze whatever happens while in a feeling. Just flow with it and allow it. As you also learned in my earlier episodes, every trigger has a part reality. It is uncomfortable to be ignored and not wanted, but not to a level where you’d lose yourself or where you go into an obsession. The other much bigger part of a trigger is early memories or imprints that are being triggered. I’m referring again to Arthur Janov’s work who talks a lot about that. I know all of that because I have gone through Primal Therapy which allowed me to explore these feelings in detail in the presence of a therapist. If you do the therapy, as deeply as I did, you can rewire your system in a way that even the impulses don’t come back so strongly. You are no longer triggered so easily. You don’t attract these types of guys anymore. However, not everyone wants to go and do countless open-end primal therapy sessions, which is why I felt that I have to share with you in what way you can leverage the possibilities that therapy brought for me. How to look at triggers and feelings? They are the key to our healing. What I’m sharing with you is about finding ways to get out of these horrible states of disempowerment and obsession where we give away our power. It’s about coming home into your heart by honoring your feelings. It’s saying to yourself, “I see you, I validate you and I am here for you.” I have walked this path just before you. I offer you my vulnerability so you can be vulnerable as well. We’re in these difficult states because we are scared not to get the love, not to be loved. It is a gut-wrenching, hopeless feeling. It felt like I’m going to die if I am not loved right now. The bad part of love addiction is that we lose ourselves in someone else. We accept abuse and compromise on a level that is not healthy anymore. We become dependent and are no longer in an empowered state, and this has consequences for all other areas of life as well. I want you to get out of that. You deserve to be in a healthy, loving and secure relationship. This is what I offer you with my work. There is one more ingredient that will speed up the process like nothing else. What I’m going to share with you is of utmost importance in this whole process. It was the all-deciding variable for me and I’m telling you this, so you can benefit from it too. It’s the power of exposure when it comes to feeling. It’s very hard to feel on your own, barely impossible, not in the depth that we have to in order for us to transform things. Exposing ourselves while we are diving into a feeling, meaning having someone watching us in our feeling is the most valuable thing you can make use of. I understand that this might scare you at first. I have exposed my feelings in the past and it made me feel ashamed, scared and oftentimes very uncomfortable. The difference that I experienced when working through it on my own or with someone present who simply held the space for me was remarkable. Someone who did not want to fix me, give me directions or tell me what I have to think or conclude. For one, you will lose so much shame you put on for the reason of not having been emotionally validated in your childhood. Number two, you will gain a sweet but grounded vulnerability and authenticity that will open doors for you on all levels. Number three, it will make you more resilient. You will feel that whatever life might throw at you, you already did one of the bravest things which is to be unapologetically who you are with all 50 shades of you. You don’t have much to fear because you already did the bravest thing. The shame, fear, and discomfort are another level of feelings. You work through them as you do with everything else. Besides, showing ourselves in our true vulnerable and authentic state is what we all have been longing for a long time. As children, we wanted mommy to see our pain and love us through it from a nonjudgmental but very loving space. It makes us feel loved. If that presence is absent, we inherit a deep feeling of shame. If we’re not loved in all of our different ways of being, we’re not fully loved and accepted. Immediately, you jeopardize your child’s sense of self-worth, self-respect, and self-love big time. Later on in life, we are scared to be us, and we do whatever it takes for people not to see the vulnerable parts in us. It also makes us lose integrity toward ourselves. It makes us hide and not be who we are, and that is the biggest lie you can tell yourself. It will backfire sooner or later. When someone holds space for you and loves you through all the different shades of you, especially when you’re showing yourself in a feeling, in your vulnerability, it is one of the most beautiful forms of love there is. You will feel deeply respected and validated and that is a feeling we have been longing for our whole life. This alone will make you feel loved so much that you do not even have to run for love in the same ways you did up until now. Now, I have a beautiful vulnerability that lets me relate to people in a whole new way. I’m much better able to love and respect even strangers. I’m able to hold space for other people that act out and, in this way, help them heal themselves. That’s why I am an emotional recycler. I talk about this in detail in Episode 13, if you’re interested to learn more about that. We don’t have to be afraid of feelings, feelings make us human. It makes us vulnerable and it will allow other people to see the real us. When you come to a place in your relationships, whether it’s with your family, your loved ones or a friend, where you can honestly vulnerably share how you feel, express, and own that, that’s like winning the lottery. At first, it might be awkward because we have to learn that new skill. We have to become comfortable with our vulnerability. Once we do, the effects of it are unimaginable. This is not about making drama, this is not about screaming around and blaming and acting out. It’s the contrary. You still get to be angry, but you’re not unloading your anger on to someone else. You feel it, you work with it, you own it and then you watch what happens. 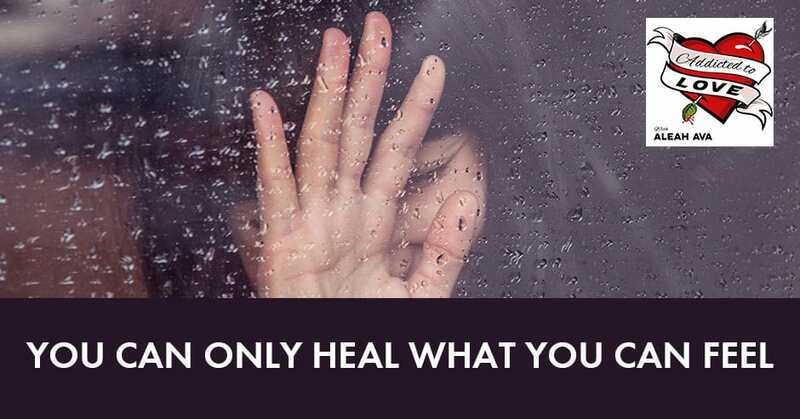 If you are ready to overcome love addiction and you’re seriously ready to do the work, then I hope you will sign up for my membership program. That is where we’re going to work through it. I will guide you in learning how to feel again, how to hold space for others where you can come with your feelings to a safe place and where people help heal each other. Go check out my page, AleahAva.com and click on Membership. 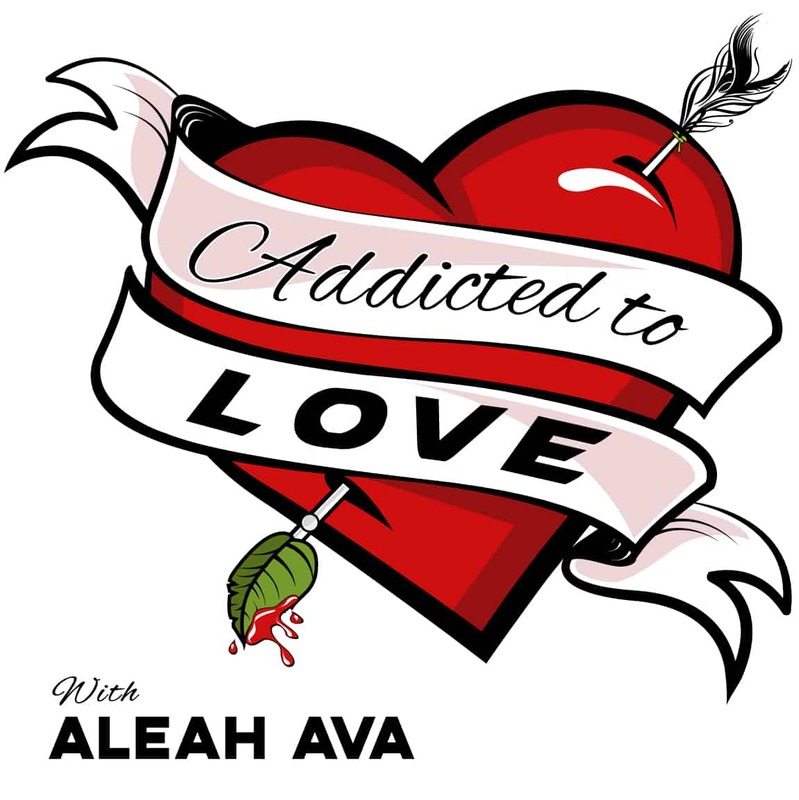 You can also go to AddictedToLovePodcast.com, click on Programs, and you’ll be redirected to my personal page. If you want to make a difference in this world, start with yourself. I can guarantee you that through making the choice of taking 100% responsibility and start feeling your feelings instead of acting out, your whole life will change for the better. Thank you and I wish you a wonderful day. See you in the next episode.